In 2006, like many people, I did not know how the Internet worked. I never used Google and did not surf the web with any great frequency. I did not have any social media profiles (Facebook, My Space), run a website, or use Twitter. The only references in a search for my name were related to my academic work. I only occasionally shopped online through eBay.com and my online communication was limited to a membership of a couple closed groups. I have a pre-exisiting life-time mood disorder, a ‘garden variety’ depression, known as Dysthymia. Like the majority of people with this mood disorder, I have suffered bouts of major depression, also known as double depression. These were primarily due to external factors such as a protracted bullying while working for the South Australian Government. But for the most part I managed it successfully for more than two decades until I turned 50 in 2006. From mid 2006 the depression became severe and crippling and continued unabated for more than three years. This was not ‘midlife crisis’, it was a ‘black’ depression from which there appeared to be no respite. Clinical research has identified the link between physiological changes and mood disorders at specific stages of the life cycle in women. Women with existing disorders have a higher risk for major depression at this time of life. At the trial I tried to describe living with major depression to His Honour Justice Blue by providing an analogy: I said to try and imagine the second or third day of a bad bout of the flu’ and needing to function at one’s normal level, with all the life expectations, and for an indeterminate amount of time and not knowing when or if it will ever abate. But it is difficult for anyone who has not suffered from a major depression to understanding the dehabilitating impact on quality of life. I sought medical help and this was not only unsuccessfull but the treatment made me sicker and nearly killed me. I initially took the medications in good faith and in desperation but there were times when driving that I had to pull over due the side effects. I was falling asleep while driving! In 2007-08 I was mis-diagnosed with bipolar disorder by my treating doctor. In fact, previous and subsequent diagnosis, including from the Defendant’s expert witness (the psychiatrist Dr Anthony Davis) and a world expert in mood disorders (Dr Mark Rowe of the Lawson Clinic) stated that they did not think that I was suffering from bipolar disorder. In 2008 I refused to take the medication for Bipolar Disorder and the heavy antipsychotics that I was prescribed because they were not working, I knew that I did not need them and the side effects are severe. The medications were making me sicker and I really did not realise how ill I was until I stopped that medication and finally found the correct treatment at the end of 2009. At that point I had been losing the battle against major depression for more than three years. Combined with unsafe and illegal working conditions, and trying to deal what was essentially a process of constructive dismissal, the unrelenting depression finally resulted in a breakdown at the end of 2008. I refuse to be ashamed because I became sick! It was during that period of severe depression that I became hooked into the Kasamba website. This came about as a result of membership in an online depression support community. After a year to 18 months I realised that I was being conned. In 2017 the data shows that online scamming is endemic. For example, according to the FBI run Internet Crime Complaint Centre (IC3), in 2016 romance scam victims lost $173m in California alone. In Australia, online scammers cost citizens more than AUD$83.5 million dollars in 2016. Ten years ago there simply wasn’t the awareness about online scamming or consumer assistance or information available from government run organisations. But there were some online complaints about Kasamba on the private websites such as Ripoff Report, Complaints Board and Pissed Consumer. In 2017 a search for the terms ‘Kasamba scam’ produces numerous complaints from consumers on these websites and others. Ripoff Report now has more than 420 separate complaints about the company Kasamba (including relating to the period in which it was known as Liveperson). Even in 2007 there were numerous complaints on Ripoff Report posted by people who had been conned by the ‘experts’. Of course, in 2007 I thought the website was a legitimate representation of the consumers’ voice. I was wrong, as I subsequently discovered while trying to find a way to get the false and defamatory content removed. In late 2007 I started a support group for people who had been ripped off by Kasamba and posted about this on Ripoff Report. The group closed after four months because we were attacked by those ‘experts’ who saw their profits from conning people compromised. I and the others were attacked on Ripoff Report, the group was infiltrated by these people who hurled abuse at us and accused me of trying to profit from supporting people. 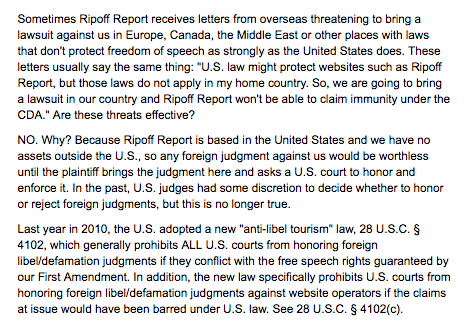 The group closed and at the end of 2007 the first of the false accusations was published on Ripoff Report. The ‘reports’ about me were a clear attempt to stop consumers joining the support group because, of course, if they realised they were being conned they stopped paying these ‘experts’. While I wasn’t happy about these two ‘reports’ (both of which were found to be published by Google and which conveyed the defamtory imputations) I did a search on Yahoo (the search engine I used at the time) and did not see any evidence of them appearing in the search results. In those days it took some time for content to be indexed in the search engines. Because I had no knowledge of how the Internet worked I thought that it was unlikely that someone would go to Ripoff Report and do a search for my name. I started another support group in 2008. The support group functioned by sharing experiences and providing information to assist individuals to make up their own mind about whether they should continue to spend hundreds and thousands of dollars on these ‘experts’. At one point the support group had two hundred members. Soon after further ‘reports’ were published on Ripoff Report. At the end of that year I did email the website to ask for removal but I did not receive a reply. My first realisation that the false and defamatory accusations were on view to the world was in March 2009 after snippets had been found by my former employer and published on Google at the top of a search for my name. 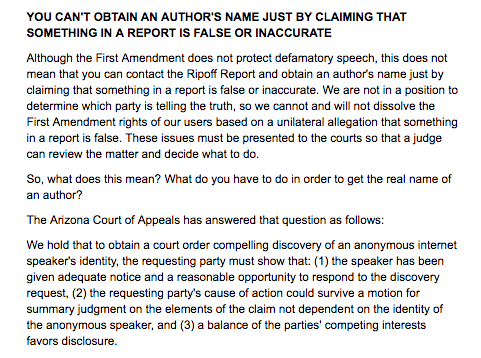 Moreover, the defamatory snippets identified me by name, location and even my phone number. After further unsuccessfull attempts to get the defamatory content removed by Ripoff Report, I embarked on a process of research to learn all that I could about Google because almost 95% of searches in Australia were (and are in 2017) conducted on that search engine. In 2009 it was very difficult to find any information on how to request removal of links and snippets from the Google index. From April 2007 removal requests to Google were only available to webmasters and only if the URL had been removed from the webpage. Nonetheless, I kept searching and finally found an email address for Google Australia. 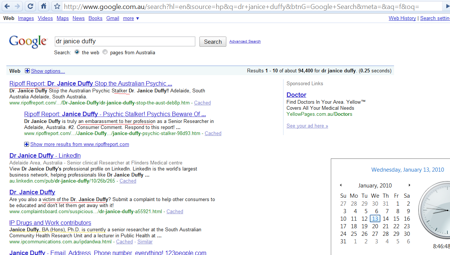 In September and October 2009 I sent several removal requests to both Google Australia and Google Inc. These were refused. Google Inc lied and said they could not remove it without the co-operation of the webmaster. Yet, after I filed proceedings and Google Inc were served they suddenly decided to remove some of the links from google.com.au based on my removal requests and concerns notices (sent under The Defamation Act, South Australia, 2005) that I had sent to both Google Inc and Google Australia in 2009 and 2010. This is a screenshot of some of the search results for my name sent to Google Inc and Google Australia with my removal requests. The first two snippets are from Ripoff Report, the third is from LinkedIn, the fourth is from Complaints Board and the fifth references my academic work. It is clear that I had reason to be worried about my employment prospects and needed them removed. In 2017, 10 years later and after winning my defamation case against Google in the Supreme Court the content found defamatory remains indexed on all Google domains. I have sued Google a second time but although they have been served the case cannot proceed until after the appeal decision. In 2009 I also combed through the medical literature in an attempt to find a way to ‘cure’ my severe depression. The ‘cure’ eventually came from a little laboratory about 4 km from my house. In addition to the severe depression, from menopause I also suffered from a variety of ‘non specific’ physical issues. I found a registered medical practitioner who ordered a blood test and said that I had severely low progesterone and testosterone levels and an abnormal thyroid functioning. This doctor prescribed a cream absorbed through the skin and said that the depression would probably abate once the bioidentical hormones kicked in. I didn’t believe him at the time but he was correct and to my great relief the ‘black’ depression slowly lifted over the next few months. This meant that I was able to fight my former employer and then Google. In late 2010 I consulted lawyers because I thought that if I filed defamation proceedings Google would just remove the content and I could get on with my life. This presumption was based on another Australian case in which two real estate agents sued Google over defamtory content. Google removed the links and the matter did not proceed. It appears that Google considered that unlike two real estate agents who deal with high priced property, someone like me would not have the resources to fight them. They were partially correct. The accessibility of knowledge and information through the Internet has revolutionised paid employment. The number of employers who use it to screen job candidates has increased 500% in the last decade. It was clear that if I ever wanted to work again I needed the links to false and defamatory content described by the trial Justice as containing ‘serious and inherently damaging imputations’ (Duffy v Google Inc (No 2) 2015 [SASC] 206 23 December 2015 paras [116 & 117] removed from Google. But Issuing defamation proceedings against Google Inc was absolutely the last resort because I did not want to endure what I knew would become a very public court battle. I also knew that once the case was picked up by the media (and this was likely given the profile of the Defendant), there was no chance that I could quietly resolve the problem and get back to my life. By 2011 I was, and AM aware of the ‘Streisand Effect’ of the Internet. This has turned out to be the case and even after I won I have been confronted with accusations that I should have lost, online ridicule and abuse, intimidation and threats of harm. To be honest, had these imputations only been published on the website Ripoff Report (and not accessible on the search engines, or published to a small number of people in a newsletter, for example, or were completely removed in response to my notifications I would not have continued with my court action. In 2011 I had no idea of the identities of the authors. In subsequent years, while preparing the ripoff Reports on Kasamba/Liveperson for the trial I did manage to tentatively identify the authors. But how could anyone satisfy the requirements to provide adequate notice without actual knowledge of the authors’ identities? My only legal option and choice was to sue Google. In 2002 an Australian High Court decision found that defamation occurs in the jurisdiction in which the plaintiff lived (Victoria), not where the material was uploaded (USA). This meant that because Google did business in Australia they were potentially liable for publications that defame its citizens. Filing defamation proceedings was my an absolute last choice! 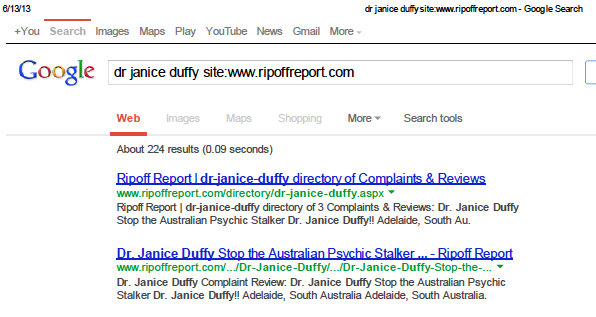 During the 18 months of unsuccessful attempts to find a way to remove the defamatory material from the first page of the Google SERPs and in the years since my case became public, I have communicated with other victims of Ripoff Report including those from Australia. They faced the same barriers: Both Ripoff Report and Google ignore or refuse requests to remove serious defamatory material. The result is lost business and work opportunities and the impact upon all facets of life are profound. Typically, victims experience an initial shock reaction which may be followed by physical, psychological and/or financial effects in the short term and possible longer term effects on employment and relationships. In addition to primary victimisation resulting from the criminal event, an individual may experience secondary victimisation resulting from the way institutions and individuals respond to their situation and needs. Victims of cyber harassment often have thoughts of suicide and this has certainly been my experience. It is difficult to understand what a company worth so much gains from refusing to remove obviously defamatory and destructive links. Google says it is ‘not the internet police’ but there is copious evidence that rather than automated search results Google make decisions about the factors that rank websites on their search engine results (SERPs) and program their algorithm based upon a continuous process of evaluation. This was admitted in the evidence by the Google experts in my trial. After I filed defamation proceedings against Google Inc it became clear that my aim of obtaining removal was at odds with the Defendant’s aim of making me ‘go away’. For example, the Defendant sent requests to my lawyers for ‘further particulars’ which included inane questions such as asking to clarify a what is a URL. Their strategy was clear, to run up my legal bills so that I would give up the legal action. The Defendant took every opportunity to obstruct the legal process and when headed for trial, refused to mediate (Duffy v Google Inc (No. 3)  SASC 1 (21 January 2016) from para ). In June 2011 I filed for an injunction to remove the links to the defamtory content. Google flew their legal team in from Sydney and kicked up a fuss in the court about the number of URLs that I requested removed (about 80), said they were not responsible as a publisher (even though Google knew about the Ripoff Report ‘business model’ from 2008), and suggested that I was in fact ‘guilty’ of stalking and harassment. Later that year Google published their Transparency Report and this detailed the removal requests they had received and actioned. From 2013 Google published data on the number of copyright removal requests that had been actioned and it was in the millions. All of this ate into my savings, which, of course was the Defendant’s aim – to ‘deep pocket’ me. I lost the injunction. Had I been successfull and the defamatory content was completely removed, I would have walked away from the litigation because I was acutely aware that until the media published about my case I could conceivably just quietly return to my life. In October 2011 I realised that I could probably not avoid media attention for much longer. I decided to put this blog online. Google promptly removed it from all of their domains. It was only re-indexed after I complained on a blog on which Matt Cutts was participating in a debate. In late November 2011 I decided to co-operate with a media request from The Australian newspaper in order to put my side of the story online. I remember sitting in the car outside the newsagent on the day it was due to be published. I felt sick to my stomach because I knew there was no way that there was no going back to my life before the defamation. The article no longer appears to be accessible but it was picked up by a leading SEO blog. Near the end of 2011 the Defendant filed an application seeking to strike out certain paragraphs of the claim or alternatively that the court should order the provision of further and better particulars pertaining to certain paragraphs of the claim or that the court should order the dismissal of the claim and the payment of costs. This was yet another ‘deep pocketing strategy designed to impose legal costs with the aim that I would give up and fail to pursue the claim. This strategy of deep pocketing is often used by big corporations to deter or stop legal action from smaller businesses or individuals. In December 2011 we had to go to a legal argument in front of a Judge to defend this application and order the Defendant to file a defence. The Defendant mounted various arguments that the pleadings were deficient and that it was an abuse of process. His Honour Judge Blumberg heard the legal argument and ordered that the claim could continue because the Defendant “failed to demonstrate any substantial prejudice or prejudice to the action by the way in which the pleading is constructed”. We had to remove two words from the claim – ‘substantially similiar’. This attempt by the Defendant to strike out my claim cost me thousands of dollars to defend which, of course was the Defendant’s aim. At that time I was living on my savings and paying legal costs. I absolutely hated going to court. In 2011, and on many occasions since I felt like I was falling apart from the inside out. But the actual trial (from 22 June 2015) was much worse than sitting in the gallery at interlocutory hearings. In October 2011 it became clear that Google was not going to completely remove the defamatory content and moreover, that I was in for a long legal battle. Although, at that stage, I had no conception of what exactly this would entail. The Defendant attended the required mediation but nothing was resolved. As the years went by we had to get court orders to obtain proper Disclosure from the Defendant and even then they failed to produce all of the requested information and evidence. I found myself in May 2015 facing a trial due to commence on 22 June with no financial resources and no choice but to try and litigate it myself. In May 2017 more than eight years after I tried to obtain removal of the defamtory content it remains online. I have sued Google a second time. Google have been served but the Court has ordered proceedings to be stayed until after the Appeal decision is handed down by the Full Court. Ripoff Report has also been sued for USD$60 million by a surgeon who has evidence that the owner paid for the defamatory content to be posted on the website. That trial is due to start in December 2017 . With a bit of luck it may mean the end of this Google enabled extortion racket!